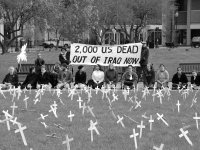 To mark the deaths of 2,000 U.S. soldiers in Iraq, 2,000 white crosses were made and installed on Worcester Common. Here’s what we learned about making crosses. Ideally you’d find some scrap latticework, or some white, waxed corrugated cardboard. If a cemetary-supply company sells crosses cheap in bulk, that would be even better. I was stuck using wood. I used “pine strapping,” boards 1″x3″x8′. I could haul 50 boards in my minivan at a time. I cut the boards in half widthwise, then into 1-foot sections, then cut these in thirds by thickness. I used a table saw. Some of the cuts were tricky. Mike Leslie: You’re cutting the house in thirds? Mike Benedetti: I’m cutting the halves in thirds. One person with one saw can cut enough wood for 2,000 crosses in three solid work days. We cut some of the pieces down to 6 inches. The upright of a cross is then 1 foot long. The crossbar is 6 inches long. The bottom of the crossbar should be 4 inches below the top of the upright. We attached the pieces with a staple gun, using one staple per cross. It is better for the staples to be a little too long than a little too short. If you want the cross to stick in the ground, attach a wire to each cross. Get some #14 wire. You can buy this at $5 per 100 feet, or cheaper in larger amounts. If you have lots of coathangers, you could use them. Cut the wire into short segments. We used 6-inch segments, but shorter ones could work. Using needle-nose pliers, make a little zig-zag in one end. Now staple the wire to the back of the cross. The staples should go on the zig-zag part. Because the crosses are very light, the wire need only stick down two inches or so below the bottom of the cross. If your wood is too thin, the staples may splinter it. Based on some frustrations in attaching the wires and in installing the crosses on the Commons, Alex Broner designed a new anchor system. In his words: Basically the same length of wire as we used (6 inches or more) is bent around the cross at one end so that it pinches the wood. Using small wire (staples) to anchor larger wire doesn’t make any sense. The wire is then bent upwards and downwards to form a ^. The end of the wire penetrates the soil AWAY from the cross spreading out the anchor for the cross from a single stake to a stake and the bottom of the cross itself. Aside from a being more stable, this design is amenable to on-site adjustment because the wire only pinches the wood rather than impaling it and breaking down its structure like multiple staples, and also because the wire can be adjusted without any special tools like a staple gun, hammer, and staple remover. If you use this system, please e-mail pieandcoffee at gmail dot com and let us know how it works on a large scale. You don’t have to paint the crosses. We didn’t paint most of the crosses for our project, and they looked OK.
White is the traditional color for memorial crosses. You should be able to water-down paint to make a “whitewash” that will do the job. You might want to include symbols from other faiths. It would not be hard to make a Star of David using the pieces of wood. You might cut them a little narrower. For other religious symbols, you can use single, wide pieces of wood, perhaps 3″x1/3″x1′. Add the symbol with a stencil. To represent Islam, a crescent is appropriate. A rope with a mark every foot was used to help place the crosses in neat rows. It has proven difficult to eyeball neat rows. The crosses look dignified when placed in a one-foot grid or a two-foot grid. The people installing the crosses can use the length of a cross to estimate distances, if a rope is not being used. It takes about 10 person-hours to set up 2,000 crosses, and about 3 person-hours to take them down. About an inch beneath the surface of the Worcester Common lawn was a layer of stones for drainage. It was hard to get the wire through this layer, and lots of wires bent. The staples fell off some of the wires. It’s worth testing the ground with a piece of wire before trying to install crosses at a location. High winds twisted the crosses around. A U-shaped wire, with two prongs, might have prevented this. See also Alex’s suggestion, above. Despite all the technical problems, it made for an effective and widely-reported demonstration. Just watched part of a documentary about “Arlington West.” They attached their crossbars with wood glue and a staple gun. Hot glue might work for thinner wood like that suggested in this article. They cut the bottom of each cross to a point. That might work when installing crosses on the beach, but I worry it would destroy a lawn.